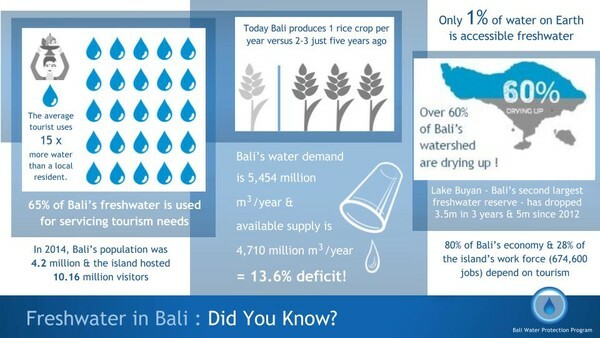 BE PART OF THE SOLUTION TO SAVE BALI's WATER! 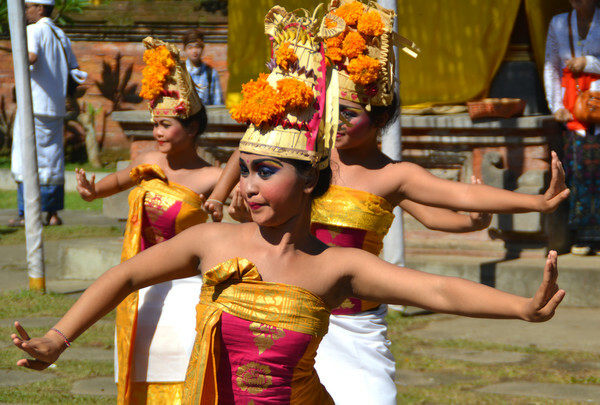 Bali’s watersheds are drying at an alarming rate, mostly due to over-extraction. Yet, Bali is one of the few islands in the world blessed by heavy rainfall and theoretically receives enough water from the rainy season to fulfil its present and future needs. Thus, rainwater only needs to be harvested to balance its consumption, and sustain an annual growth in millions of tourists visiting the popular holiday island. Bali is facing a decrease of its water tables levels as well as saltwater intrusion into freshwater aquifers due to excessive extraction of water. 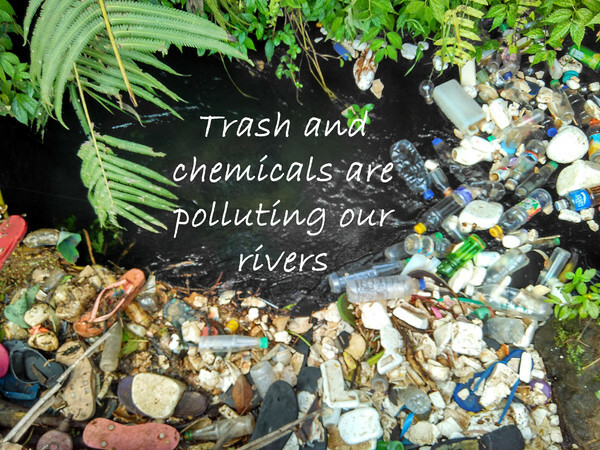 Bali’s freshwater pollution is also growing at an alarming rate due the illegal trash disposal and excessive use of chemical for agriculture farming. 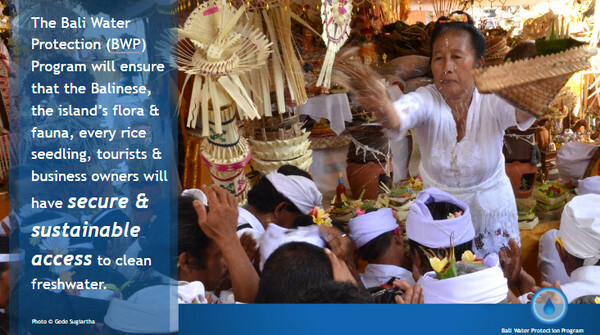 Despite all the threats to Bali's freshwater, we are thrilled to know how to impulse positive change! 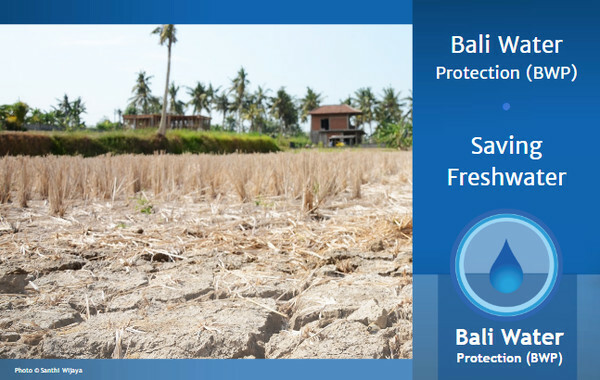 The Bali Water Protection Program (BWP) proposes to impulse freshwater resilience and good practice throughout the province through 3 subprograms. 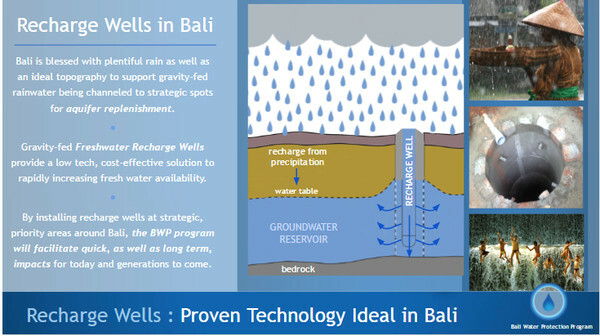 BWP will harvest rainwater by the construction of 136 recharge wells ensuring rapid freshwater replenishment on the main island of Bali, and also on the nearby sister islands of Nusa Penida, Nusa Lembongan Nusa Ceningan – also in Bali province. The island’s topography is ideal to facilitate collection and ensure the island’s supply of water for the centuries to come. How wonderful would it be to collect what nature provides to us: helping nature helps itself! There is nothing more powerful than educating the next generation. While the current one can act now, the future of Bali's river heavily depends on what schoolkids will learn. 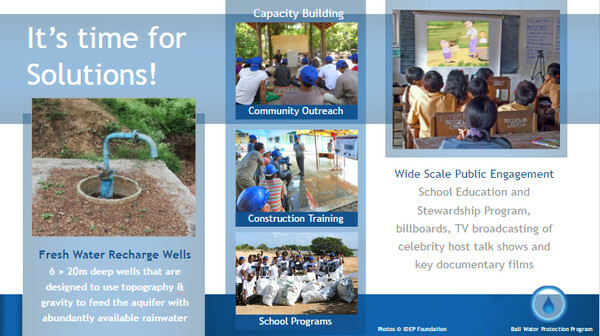 Thus, BWP will ensure that the water quality itself will improve thanks to educational programs targeting schools located alongside the rivers. 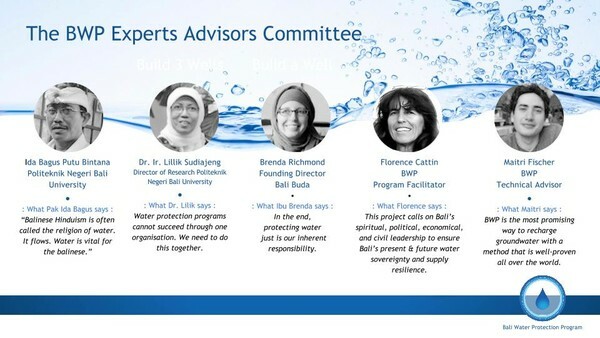 BWP will participate in raising general awareness about how precious water is, what the current situation is like, and how important it is to reduce the water consumption. We need help: We are calling for your generosity to help us to save Bali’s freshwater. As a Bali lover, a resident, a tourism entrepreneur, or tourist…, everyone can help us to ensure the island’s freshwater resilience. Each dollar will help us to achieve our goal! Do some good: We offer you Satisfaction to help restore and protect the most amazing element that Nature offers Humanity: water . We will of course send you personalized certificates of contribution. Help us fundraise : become a program’s ambassador: we would like to invite you to be part of a circle of support which we are calling '8 circle'. It would entail you into donating 5US$ and inviting 5 of your own network to do likewise and each invite 5 other persons. 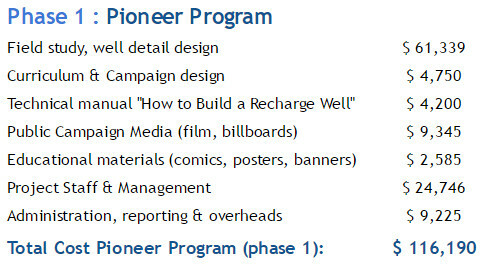 The idea is that shortly after the 7th level, we would reach our program's full funding. Is that a dynamic that you would be interested in assisting us with? In order to increase our funding chances we are also offering businesses to join our Corporate Social Responsibility (CSR) program. WHERE IS YOUR FUND GOING ? WHY YOU SHOULD SUPPORT BWP? 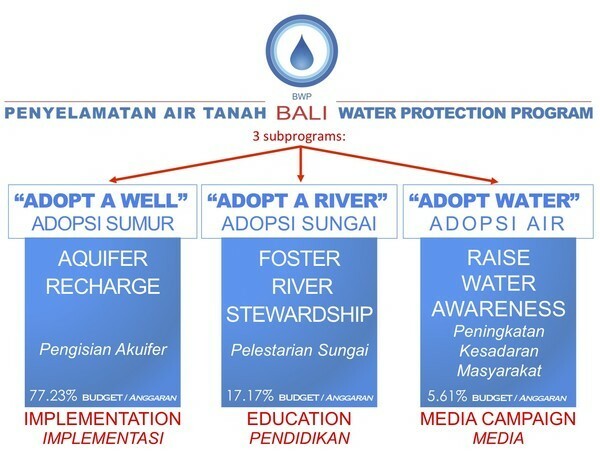 While the BWP program cannot fix the entire water depletion problem, it has the strong opportunity to significantly contribute to Bali's aquifers recharge and to impulse good-practice freshwater management at the provincial level - contributing to a blueprint for new and best practice water legislation and good practice for Bali's businesses. Our Foundation as well as our partner Politechnik Negeri Bali University both have extended field and program management experience. 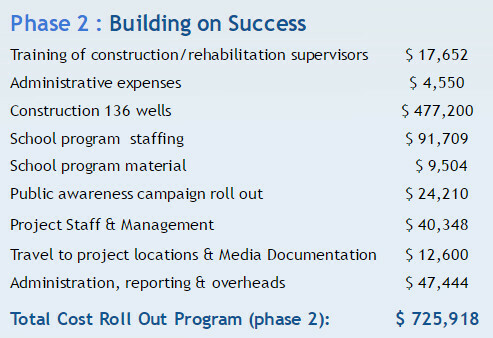 No funds will be used until the initial target is reached then until Phase 2 is raised – allowing BWP to produce deliverables of subprograms as funding is achieved. IDEP's reputation is outstanding and its 17 years of existence and clean records deserve your trust. 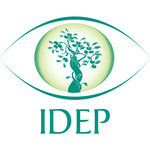 Our accounts are independently audited, published yearly and are accessible on-line, please see http://idepfoundation.org/aboutidep/annualauditorsreports . Yayasan IDEP Selaras Alam is managing the funds for this campaign. Yayasan IDEP Selaras Alam is a verified organization.